The Hospitality Sales & Marketing Association International (HSMAI), the global organization of hospitality sales, marketing and revenue management professionals, on Jan. 22 presented the Arlington Convention and Visitors Service (ACVS) with a 2018 Adrian Award for the StayArlington tourism website. Since 1957, the Adrian Awards have recognized creativity and innovation in advertising, digital marketing and public relations. This year’s winners, soon to be showcased in an online gallery, were selected by senior industry experts from a field of more than 1,100 entries. Arlington received a Bronze Award in the Website Design & Development category for its 2017 site redevelopment by Philadelphia-based Tempest Interactive Media. Since its launch, the new website has hosted nearly 240,000 visitors, an increase of 56 percent over the same amount of time for the previous site. Additionally, its user-friendly, research-based structure is resulting in better visibility by online search engines, and increasingly effective digital marketing to vacationers considering the nation’s capital. Tourism revenue for Arlington reached a record $3.3 billion in 2017, a 4.5 percent increase over 2016, according to the U.S. Travel Association. Arlington has led Virginia counties in visitor spending since 2009, with tourism supporting more than 26,000 jobs and generating nearly $92 million in local tax receipts that benefit County programs and services. A division within Arlington Economic Development, the Arlington Convention and Visitors Service (ACVS) is Arlington County’s official destination marketing organization. Funded primarily through a guest-paid, 1/4-cent tax on hotel rooms, ACVS promotes Arlington as the perfect combination of convenience, value and local flavor for travelers visiting the Washington, D.C., region. 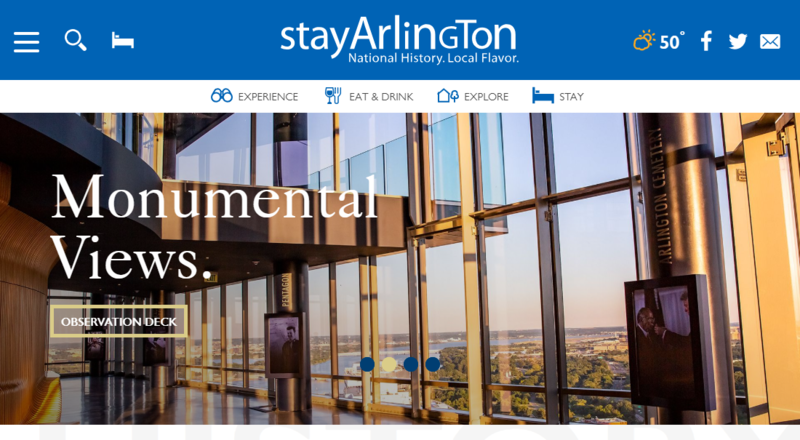 For more information on Arlington tourism, visit www.stayarlington.com.